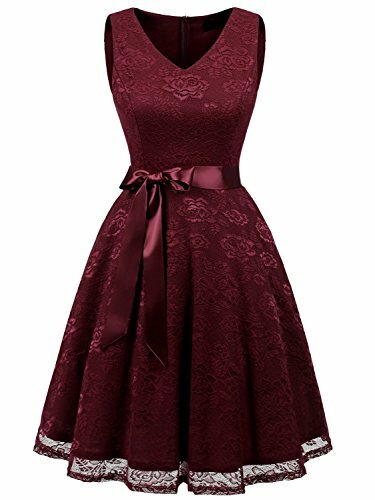 Brand: Mixfeer Color Option: Black/Dark Blue/Burgundy/Yellow/White Sleeve: 3/4 Sleeve Design: Deep-v neck and zipper on the back, Floral lace pattern Feature: Floral lace pattern? 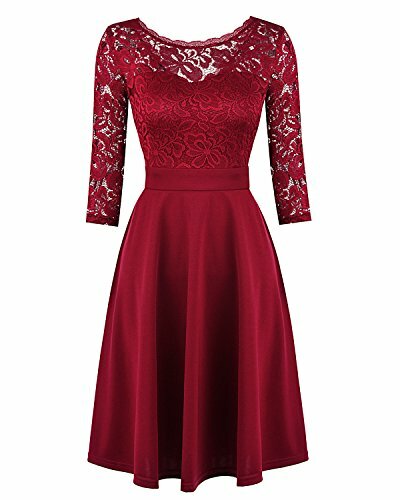 ?slim cutting,deep-v neck and zipper on the back,2/3 Sleeve ,below knees Ocassions: Suit for Wedding Party Casual Wear Outdoor Porm and etc Our Model Information: Height 177cm, Bust 86cm, Waist 64cm, Hip 90cm, she fits S. Please choose you size according to our size chart Package Content:1 x Women's cocktail party dress *Size Chart(inch) Please Check your Measurements to Make Sure the Item Fits Before Ordering. 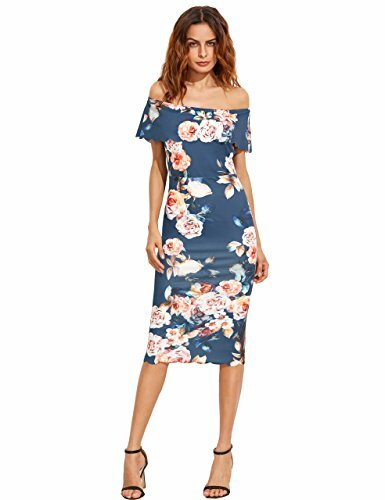 S--- Bust: 33.86"--- Waist: 27.56"--- Sleeve: 14.96"--- Length: 37.2"--- Shoulder: 14.76" M--- Bust: 35.43"--- Waist: 29.13"--- Sleeve: 15.35"--- Length: 37.8"--- Shoulder: 15.16" L--- Bust: 37.0"--- Waist: 30.71"--- Sleeve: 15.75"--- Length: 38.4"--- Shoulder: 15.55" XL--- Bust: 38.58"--- Waist: 32.28"--- Sleeve: 16.14"--- Length: 39.0"--- Shoulder: 15.94" *About Mixfeer We only sell Women's clothing with high quality and provide the best customer service for the customers.Mixfeer trademark is protected by US Trademark Law. 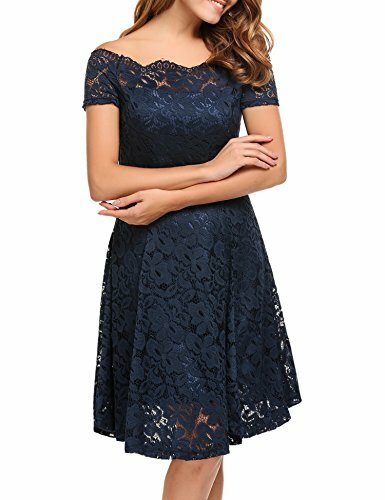 Maxfeer's team in women's clothing is professional,we firmly believe that our products can help you increase confidence and gorgeous if you buy from our store. 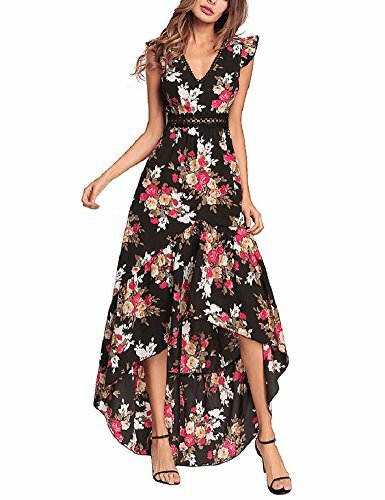 Women Elegant Backless Floral Print Maxi Dress High Low Cocktail Paery Dresses About the Dress: Style: Backless, V-Neck, High Low, Floral Print. 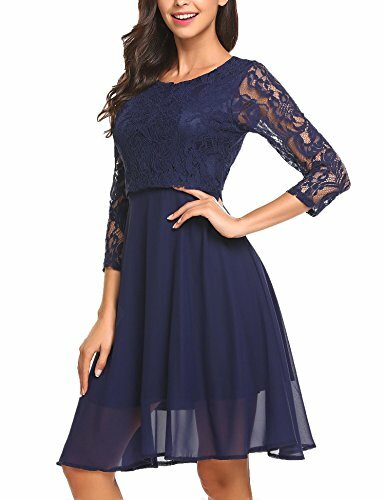 Material: 100% Polyester Occasion:Casual, Beach, Party, Evening, Cocktail, Formal, Ball. Tips: Garment Care: Machine wash / Hand wash. Please kindly check our left size chart to find the size you need, but not based on your normal preference. Note: Please allow 1-2cm (0.4-0.8inch) differences due to manual measurement. As Different Computers Display Colors Differently, the Color of the Actual Item May Vary Slightly Differ From the Above Images. Service: Please contact us without any hesitation, we will help you within 24hours. 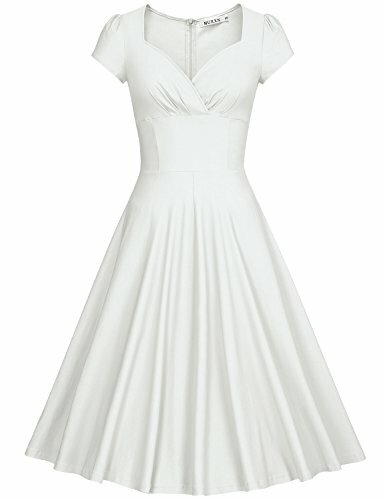 The babydoll style dress looks quite adorable and elegant! 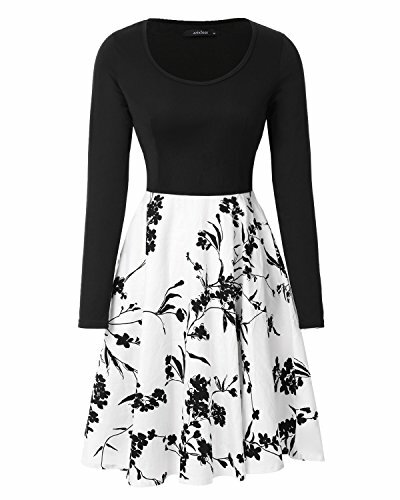 Note : The Pure Color Dress is High Stretchy, and Floral Pattern and Polka Dot Pattern Dress is Little Stretchy. 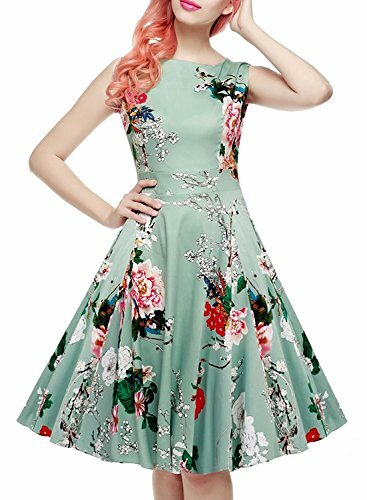 Size Information S: BUST: 33.07"- 34.25" WAIST: 25.19"- 26" SHOULDER: 14.5" - 14.87" LENGTH: 40.55" M: BUST: 34.64"- 36.19" WAIST: 26.75"- 28.34" SHOULDER: 14.93" - 15.38" LENGTH: 41.34" L: BUST: 37"- 38.18" WAIST: 28.74"- 29.58" SHOULDER: 15.48" - 15.81" LENGTH: 42.13" XL: BUST: 38.58"- 40" WAIST: 30.31"- 32" SHOULDER: 15.75" - 15.93" LENGTH: 42.91" 2XL: BUST: 40.55"- 42" WAIST: 32.40"- 34" SHOULDER: 16.39" - 16.93" LENGTH: 43.7" New And Tagged. This Size Information Is Just For Reference Only,And Allow 1-2cm (0.4-0.8") Differences Due To Manual Measurement, Thanks. 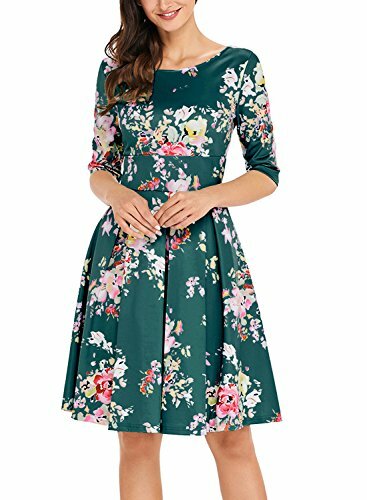 US S---Shoulder 36.8cm/14.5"---Sleeve 47cm/18.5"---Bust 81cm/31.9"---Waist 69cm/27.1"---Middle Back Length 88.5cm/34.8" US M---Shoulder 38cm/14.9"---Sleeve 48cm/18.9"---Bust 86cm/33.8"---Waist 74cm/29.1"---Middle Back Length 90cm/35.4" US L---Shoulder 39.2cm/15.4"---Sleeve 49cm/19.3"---Bust 91cm/35.8"---Waist 79cm/31.1"---Middle Back Length 91.5cm/36" US XL---Shoulder 40.4cm/15.9"---Sleeve 50cm/19.7"---Bust 96cm/37.8"---Waist 84cm/33.1"---Middle Back Length 93cm/36.6" US XXL---Shoulder 41.6cm/16.4"---Sleeve 51cm/20.1"---Bust 101cm/39.7"---Waist 89cm/35"---Middle Back Length 94.5cm/37.2"
Material: Fabric 1:95% Polyester& 5% Spandex.Fabric 2:95% cotton and 5% spandex.Features: Scoop neck, Long sleeves,Floral print, Slim Fitting, Knee length,Two open pockets, Zipper on the left side.Occasion: Cocktail/Party/Work/Picnic/CasualPlease pay attention to the size in the size chart and purchase the right size of clothes according to the size chart*Size Chart: S-------Shoulder:14.6"-----Bust:33.9"-----Sleeve:22.83"-----Waist:27.56"-----Length:34.25" M------ Shoulder:15.0"-----Bust:35.4"-----Sleeve:23.23"-----Waist:29.13"-----Length:34.84" L-------Shoulder:15.4"-----Bust:37.0"-----Sleeve:23.62"-----Waist:30.71"-----Length:35.43" XL-----Shoulder:15.7"-----Bust:38.6"-----Sleeve:24.02"-----Waist:32.68"-----Length:36.02" Package: 1* Midi Dress*About Mixfeer: You come to the right store, Mixfeer's clothing with high quality and provide the best customer service for you. We love how everyone who wears Mixfeer's clothes shows their own unique fashion on it! Come here, you can enjoy our best service, we always try our best to satisfy our customer.